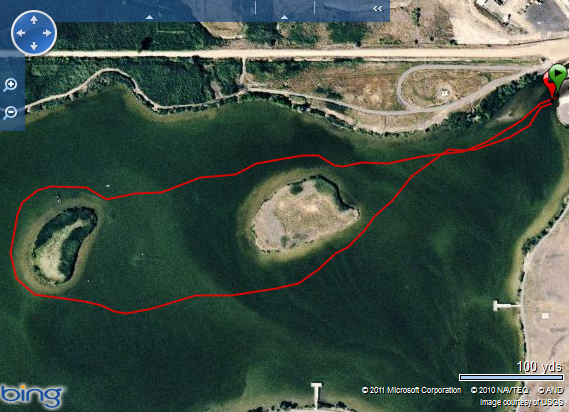 The "Josh Green Loop Virtual Open Water Swim" course. My friend Gords surprised me by putting together an awesome virtual open water swim competition. He did me the great honor of giving the competition my name. The Josh Green Loop Virtual Open Water Swim is a free "virtual" swim, which means that it can be completed on your own time. The course is at Bountiful Lake and is 0.7 miles. It starts at the boat ramp and goes west, around the second island, and back. To participate, all you have to do it take a picture or video at the start and end of your swim as well as the time on your stopwatch. Results are submitted directly to Gords, who will post them on his blog as well as on Openwaterpedia. The person holding the fastest time will be given a sweet trophy which is passed to new swimmers as the record is broken. Gords set the standard last week at 18:50. It really wasn't this dark when I started, I think it's because of the flash. I got to the lake at about 6:00am this morning to make my attempt. I got in the water and swam 50 yards or so to get used to the water temp and then got back out to start my time. I hit the "start" button on the GPS in my cap and rushed into the water. When I dove in, my goggles filled up with water on one side and I had to stop to empty them out...nice way to start a timed race. I felt like I went out too fast and was having trouble getting my breathing under control, but I also didn't want to slow down. I knew I was going to have to push it to get close to Gords' time. The islands are deceiving. I wanted to stay close so that I didn't end up swimming more than I had to, but I got too close a couple times and started scraping the bottom with my hands. I had to quickly adjust my course to get into deeper water. At the halfway point, I was feeling OK. I rounded the second island and headed back. By this time my goggles had fogged and I couldn't seen anything when I lifted my head to sight. I was just guessing where I needed to go. Finally I had to stop and rinse them out so that I could see. By the time I got around the first island they had fogged up again and I found myself going off course. By this time I was breathing about every stroke. One one breath I saw a couple guys in a canoe and it kind of scared me because I wasn't expecting anyone else there that early. Once my hand touched the bottom near the ramp, I stood up and ran out of the water. When I had completely cleared the water, I took off my cap to look at my time on the GPS. I was surprised to see that I had beat the record by just less than a second. My official time was 18:49.07 and, with all my mistakes, ended up swimming 0.71 miles instead of 0.7. Official time: 18:49.07. Distance swam: 0.71 miles. I had a lot of fun this morning and I'm sure I'll be back to try to beat my time (even after someone fast comes in and destroys it). Thanks Gords for organizing such a cool event! This post made me smile. You definitely have got faster Josh. You even stopped to quickly defog? Dang! I updated Openwaterpedia with the new record. The trophy should arrive either later this week or early next week. I'll hand it over as soon as it gets here. I bet within a couple years, this will be the most coveted swimming title in the state! I thought for sure I wasn't going to make it. You can see on my GPS map that I kept running into the islands and had to swim back to deeper water. I also added extra distance at the finish from the last island to the boat ramp. I'm sure I could get a faster time just by swimming the course better. I'll be trying it again for sure! Thanks again for organizing this competition, it's awesome! Great post, but you could have put the GPS inside the Aquaspotter pocket instead of inside your swim cap. Even if you didnt want to use the flag of the Aquaspotter, it still would have worked. Way to go Josh! You are a swimming machine!